On Tuesday, former Vice President, senator, Nobel Prize winner, and author stopped by my work. 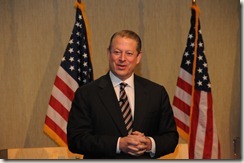 He was there to promote his new book, Our Choice: A Plan to Solve the Climate Crisis. He said his book, An Inconvenient Truth: The Planetary Emergency of Global Warming and What We Can Do About It, was more about the evidence that the Earth is warming, and that humans are the cause. Our Choice is about the ideas to solve the crisis -- from solar to nuclear power. Just one hour of sunlight can power the earth for an entire year. The population on earth will level off at about 9.1 billion, since most people are not having more than one or two children (and many other factors). He thinks President Obama is doing a good job of getting climate change on the agenda -- but it's clear he thinks we should be even more aggressive. One thing he said was that companies will be required to report their carbon emissions starting in 2010. He said that even if you guarantee the safety of nuclear plants and contain their waste, there are too many questions around cost and building estimates. 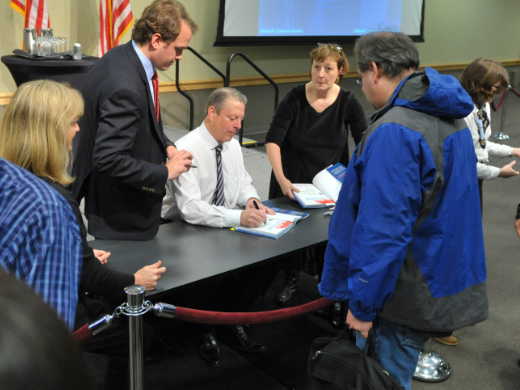 After Gore spoke for an hour, he signed books for a lot of people. 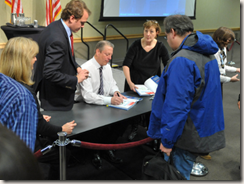 Here I am getting my book signed (I'm the one in the blue coat). I bought the young reader's edition Our Choice: How We Can Solve the Climate Crisis (Young Reader Edition) for my two sons. Later that day, I was talking to my wife Brenda about Al Gore's life and all he's done. 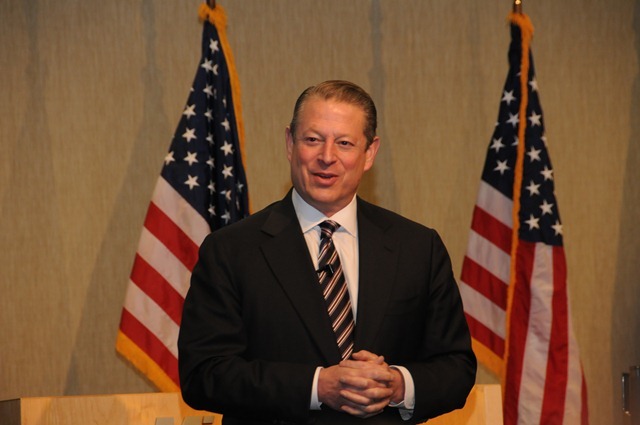 The one thing people usually think about is that he lost the election to George W. Bush (thanks to the Supreme Court); but I think Gore is one of the rare politicians who was able to make a difference outside of public service. You could say that he probably made even more of a difference, providing the tipping point for America to wake up and take this problem seriously. Now we just need to continue to take action and decrease our carbon-based energy emissions. I think it can be done.